This is ridiculous. 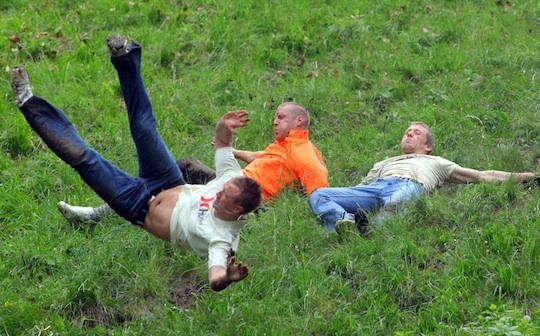 The UK's annual Cooper's Hill Cheese-Rolling—in which a wheel of cheese is hurled down a large hill and a bunch of yahoos chase after it, inevitably hurting themselves in the process—has been canceled due to safety concerns. Not for the participants, who are somewhat delightfully deranged and therefor on their own, but for the large crowds that have shown up in recent years to watch the spectacle. Authorities say the site is not equipped to handle the record 15,000 people who showed up last year; there are concerns about clogged roadways and ambulance access for the participants. Are we honestly so safety-concerned now that there wasn't anything that could be done to continue a tradition that is hundreds of years old? 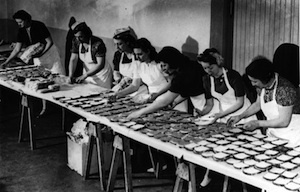 Call us cranks, but back in our day you had salt in your restaurants, and you could roll a wheel of cheese down a hill if you damn well pleased. Fifteen thousand people showed up to watch other people chase after a cheese wheel? Not to chase it themselves, but just watch? And Because of them, the actual chasers can't do what they do best? That's just pitiful.